Another tourist attraction in Singapore. 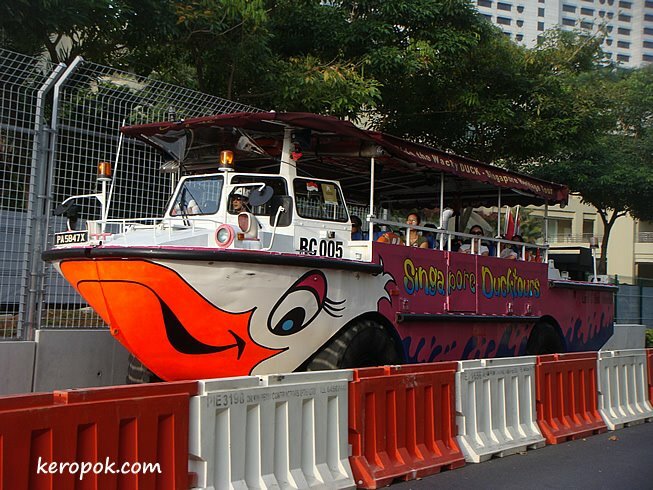 A 'beast' that can travel on the roads and also on water. Caught this few weeks ago just before the F1 race with all the barricades around. What an interesting vehicle and appropriately named! If you ever get the chance to ride around in one of these in the middle of the ocean do it because they bob around worse than a cork. And the get swamped easily and sink to the bottom of the Pacific like a stone. They had one here for rides and it sunk in the river once but people were not drowned. When I was in the Army they were called, "Ducks" and soldiers said they were unsafe in a puddle of water. We have one of those here in Seattle!! This looks like fun! Love the paint job!